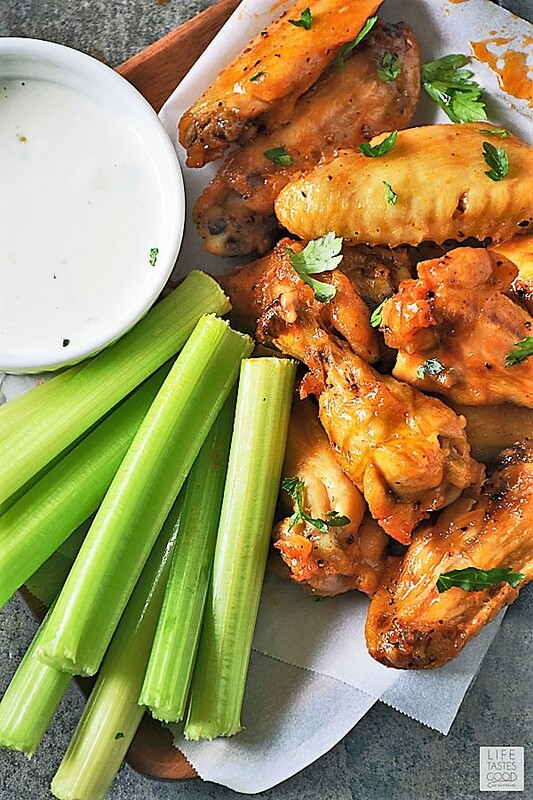 Low Carb Buffalo Wings with the most amazing Gorgonzola Cheese Dipping Sauce will change your world! 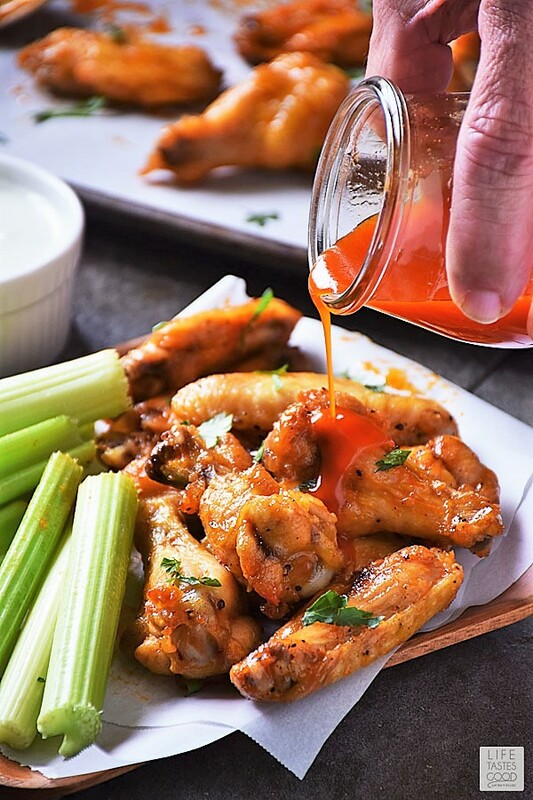 With this recipe for baked low carb buffalo wings you can make restaurant style wings at home for a fraction of the cost! This is the perfect appetizer for a keto diet, but even if you aren't counting your carbs, you will love this easy appetizer recipe! Traditionally, Buffalo wings are not breaded, so this favorite appetizer recipe is naturally low in carbs. You do have to be careful if you order Buffalo wings when dining out, though, as many times they will be breaded making them high in carbs. But who needs restaurant wings when you can make them just as good, if not even better, right at home for a fraction of the cost (and carbs)!! We love to enjoy these for game day, especially the super bowl, and on occasion, I'll even make this low carb appetizer for our main dish at dinner time. 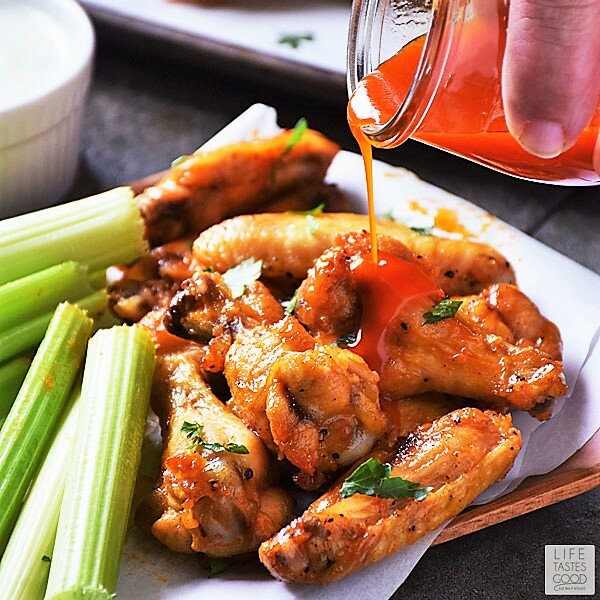 The buttery and spicy buffalo wing sauce paired with tangy Gorgonzola sauce with celery sticks on the side will be your go-to easy football food every weekend and the star of your super bowl party! Like my Baked Buffalo Cauliflower Bites, baking these low carb buffalo wings makes this recipe easier and much less messy than frying, and they still have amazing flavor. Because these wings are baked, they won't be as crunchy as traditional fried wings, but they still pack a pretty satisfying crunch. 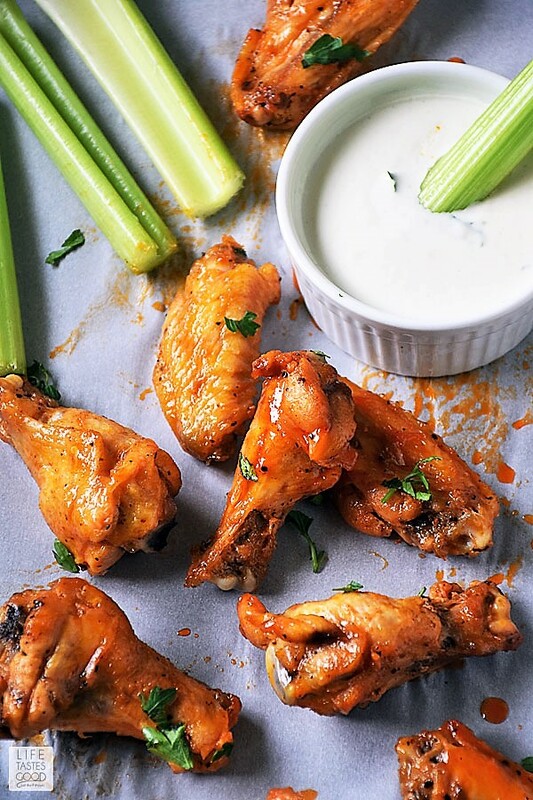 Upon first bite of one of these wings dipped in the Gorgonzola sauce it's unlikely you'll miss anything as you savor the out of this world flavor combination of baked low carb buffalo wings with the homemade creamy Gorgonzola sauce. There are basically no carbs in the buffalo wings themselves. Frank's Red Hot Sauce and butter don't have carbs and the chicken doesn't either, so this recipe is perfect for a low carb, keto diet. The Gorgonzola sauce is very low in carbs as well. It is made with Gorgonzola cheese, a little bit of Parmesan cheese, and heavy cream and will have only about a half carb per tablespoon. As you can see, it's easy to enjoy this appetizer recipe when on a low carb, keto diet. If you haven't had Gorgonzola cheese before it is very similar to blue cheese only milder in flavor. I am not a fan of blue cheese, but I can't get enough of Gorgonzola. This Italian blue cheese has quickly become my favorite for using in cheese sauces such as this dipping sauce and it makes an amazing mac and cheese for the carb lovers among you. 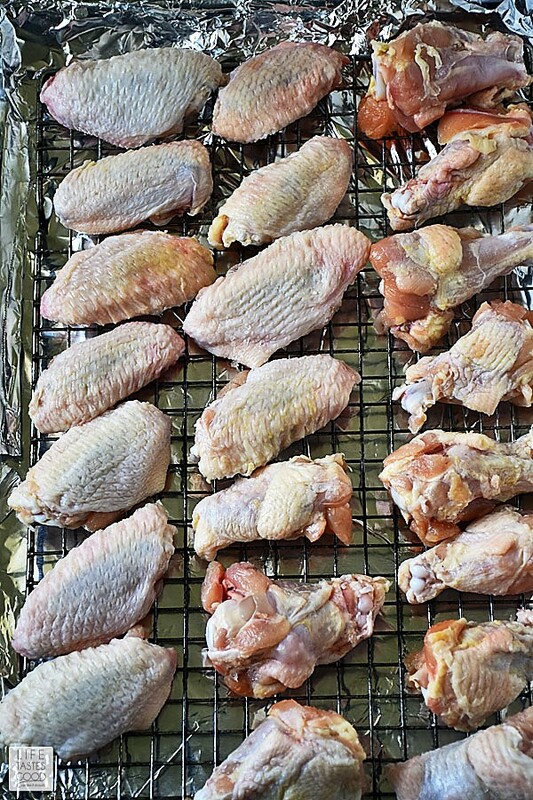 Early in the day, dry the wings and arrange them in a single layer on a baking rack placed inside of a baking sheet. Place the baking sheet in the refrigerator. This allows the skin to dry out which will result in a crispier wing once baked. 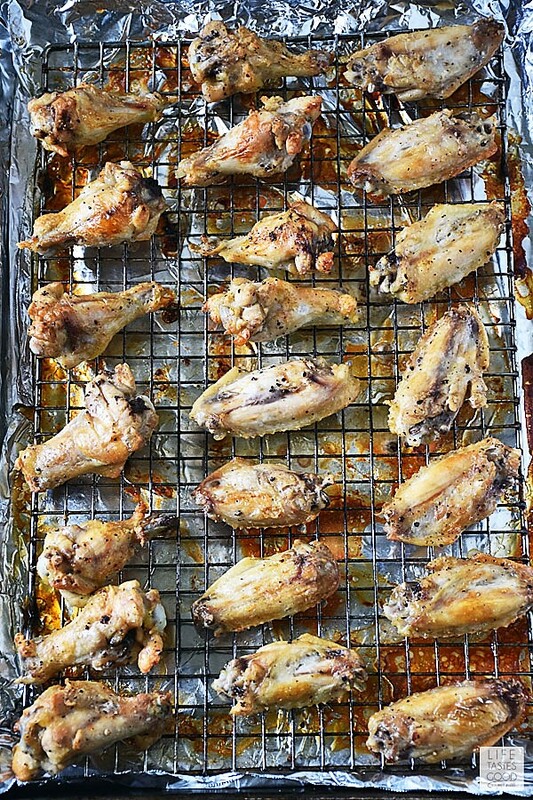 For best results, bake the chicken wings on the rack set inside the baking sheet. This allows the chicken wings to get crispier by baking up off the baking sheet for good airflow and allowing their natural juices to drip down into the pan. If you bake them in the pan they will steam in their own juices and won't have a chance to get crispy. Once you put the wings in the oven, start the Gorgonzola sauce. Reducing the cream down takes time, but it is totally worth it in the end when you have the most amazing Gorgonzola Cheese Dipping Sauce to pair with the buffalo wings. Watch the cream carefully! It will boil over the pot and make a mess with little notice. Once the cream starts to boil, turn it down to low heat and simmer the rest of time, stirring occasionally. While the cream is reducing, prepare the buffalo wing sauce. I like to melt the butter in a saucepan with the Frank's Red Hot Sauce. Whisking together while the butter melts helps the butter and the hot sauce to combine into the thickened buffalo wing sauce. You can heat the two in the microwave and whisk together once heated. Be sure to whisk well until combined and thickened. For a visual recipe tutorial, refer to my how-to photo tutorial below the recipe. 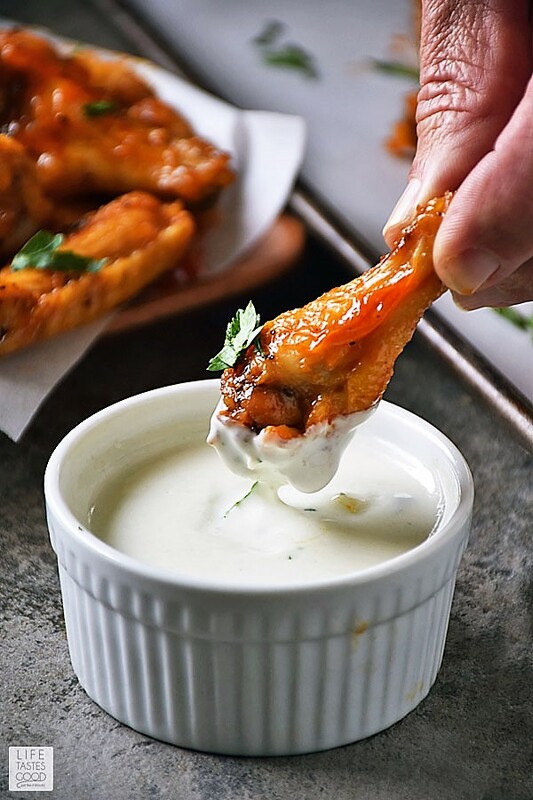 Low Carb Buffalo Wings with the most amazing Gorgonzola Cheese Dipping Sauce will change your world! 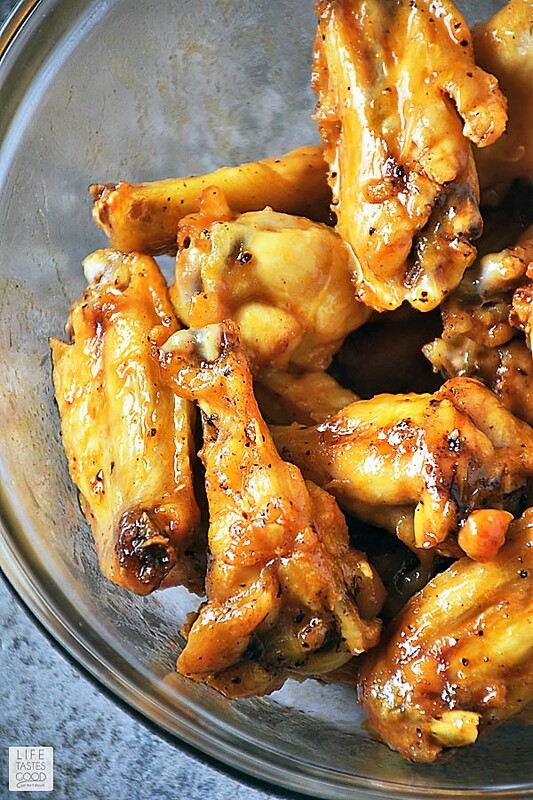 With this recipe for baked low carb buffalo wings you can make restaurant style wings at home for a fraction of the cost! Line a baking sheet with foil and set a wire rack on top of the foil in the baking sheet. Dry the chicken wing pieces and arrange them in a single layer on the rack. You can place them close together if needed. Place the baking sheet in the refrigerator for a few hours or overnight. 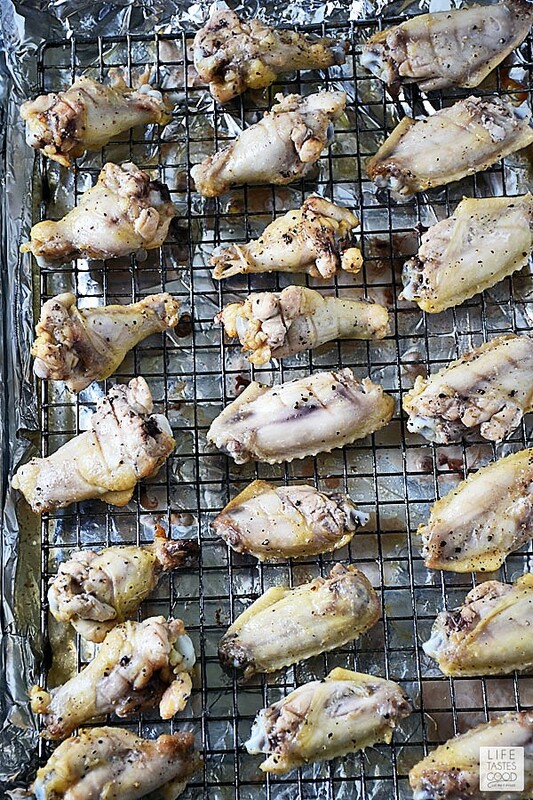 When ready to bake the chicken wings, preheat the oven to 400° F. Place the wings in a large bowl and replace the foil lining under the rack in the baking sheet. It will likely have liquid on the foil, so you want to replace the foil or dry it thoroughly. Then place the baking rack back on top of the foil and spray liberally with cooking spray. In the bowl with the chicken add 1 tablespoon vegetable oil, 1 1/2 teaspoons kosher salt, and 1 teaspoon freshly cracked black pepper. Toss to coat the chicken well. 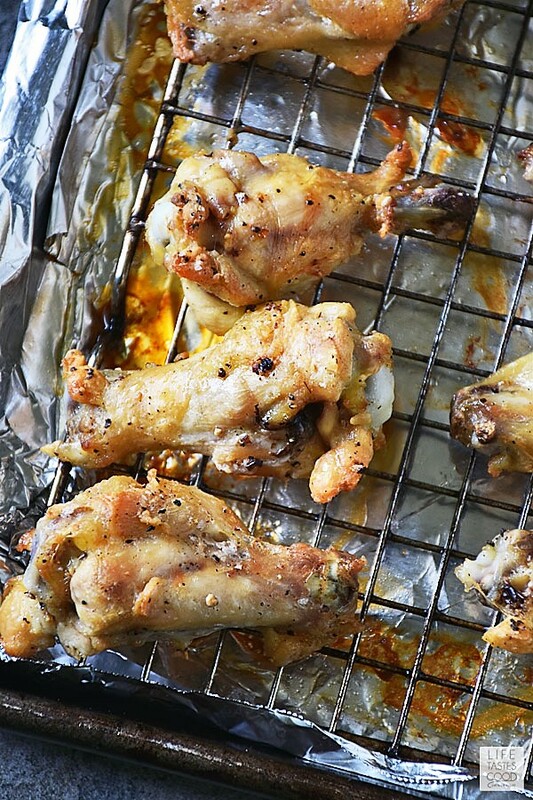 Arrange seasoned chicken wings in a single layer on the greased baking rack and place in the oven. Cook the wings for 30 minutes and then remove the baking sheet from the oven and carefully turn over each chicken wing. Place back in the oven and bake an additional 20 minutes until cooked through and browned nicely. Chicken should be cooked through to 165°F with no pink remaining inside. While the chicken wings are baking start the Gorgonzola sauce. In a medium saucepan set over medium, heat 2 cups heavy cream just to boiling. Watch this carefully as it boils over easily with little notice!! As soon as the cream starts to boil, reduce heat to low and simmer for about 45 minutes until the cream is reduced and slightly thickened. Add 3-4 ounces of crumbly Gorgonzola cheese and 1 tablespoon Parmesan cheese to the thickened cream. Stir until the cheese melts and creates a smooth, thickened cheese sauce. Give it a taste and add salt and pepper as needed. While the cheese sauce is simmering prepare the Buffalo wing sauce by heating 3 tablespoons butter and 3 ounces Frank's Red Hot Sauce in a small saucepan over medium heat. Whisk while heating to combine. 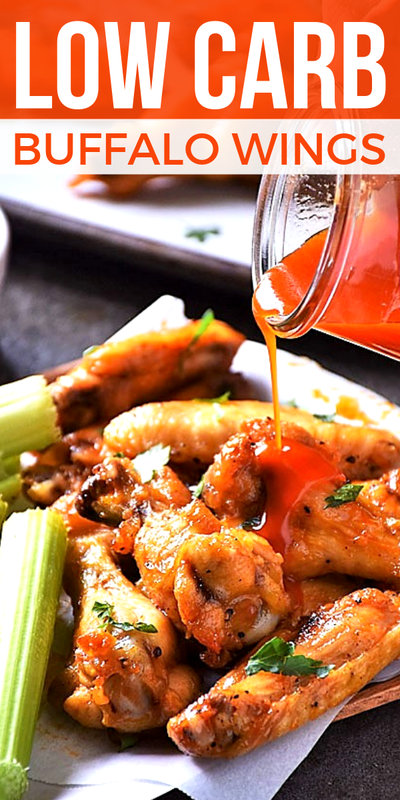 When butter is melted and combined with the hot sauce, set aside until the wings are ready. Once wings are cooked through, put them in a heat safe bowl and toss with the hot sauce/butter mixture. Toss to coat wings evenly. Serve with Gorgonzola sauce and enjoy! Cook the wings for 30 minutes and then remove the baking sheet from the oven and carefully turn over each chicken wing. Place back in the oven and bake an additional 20 minutes until cooked through and browned nicely. Once wings are cooked through, put them in a heat safe bowl and toss with the hot sauce/butter mixture. Toss to coat wings evenly. Serve with the Gorgonzola Cheese Dipping Sauce and enjoy!